USES: This medication is used alone or with other medications to treat Parkinson's disease. It can improve your ability to move and decrease shakiness (tremor), stiffness, slowed movement, and unsteadiness. It may also decrease the number of episodes of not being able to move ("on-off syndrome"). 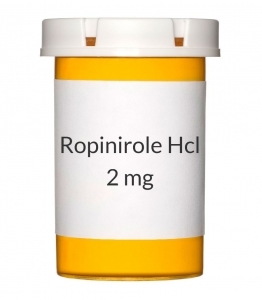 Ropinirole is also used to treat restless legs syndrome (RLS). It may improve your sleep by decreasing the urge to move your legs and decreasing uncomfortable/unpleasant feelings in the legs. This medication works by helping to restore the balance of a certain natural substance (dopamine) in the brain. HOW TO USE: Read the Patient Information Leaflet provided by your pharmacist before you start taking ropinirole and each time you get a refill. If you have any questions regarding the information, consult your doctor or pharmacist. If you are taking this medication for Parkinson's disease, take this medication by mouth with or without food, usually 3 times a day as directed by your doctor. Taking this medication with food may reduce nausea. To decrease the risk of side effects (e.g., drowsiness, low blood pressure) when you first start taking ropinirole, your doctor will slowly increase your dosage until the best dose for you is reached. If you are using this medication for RLS, take this medication by mouth, usually once daily with or without food, 1-3 hours before bedtime or as directed by your doctor. Use this medication regularly in order to get the most benefit from it. To help you remember, use it at the same time(s) each day. Take this medication as prescribed. Do not increase your dose or take it more often than directed. If you stop taking this medication for several days, you may need to increase your dose slowly back to your previous dosage. Talk with your doctor about how to restart the medication. Do not stop taking this medication without your doctor's approval. If you suddenly stop taking this drug, withdrawal reactions may occur. Such reactions can include fever, muscle stiffness and confusion. Report any such reactions to your doctor immediately. When stopping extended, regular treatment with this drug, gradually reducing the dosage as directed will help prevent withdrawal reactions. Consult your doctor or pharmacist for more details. The dosage is based on your medical condition and response to therapy. It may take a few weeks for this medication to take effect. Inform your doctor if your symptoms do not improve or if they worsen. SIDE EFFECTS: Nausea, vomiting, constipation, dizziness, drowsiness, weakness, unusual sweating, headache, and dry mouth may occur. If these effects persist or worsen, notify your doctor promptly. Remember that your doctor has prescribed this medication because he or she has judged that the benefit to you is greater than the risk of side effects. Many people using this medication do not have serious side effects. Tell your doctor immediately if any of these unlikely but serious side effects occur: difficulty moving or walking, mental/mood changes (e.g., confusion, depression, hallucinations, memory problems, trouble sleeping), muscle cramps/spasms, decreased sexual ability, unusual urges (e.g., increased gambling or sexual urges). Tell your doctor immediately if any of these rare but very serious side effects occur: anxiety/restlessness, swelling of the ankles/feet, chest pain, unusually fast/slow/irregular heartbeat, vision changes. Some people taking ropinirole have reported falling asleep suddenly during their usual daily activities (e.g., talking on the phone, driving). In some cases, sleep occurred without any feelings of drowsiness beforehand. This sleep effect may occur any time during treatment with ropinirole, including up to 1 year after starting the medication. Therefore, you should not drive or take part in other possibly dangerous activities until you are certain that this medication will not cause drowsiness or sudden sleep. If you experience increased sleepiness or fall asleep during the day, do not drive or take part in other possibly dangerous activities until you have discussed this effect with your doctor. Your risk is increased with use of alcohol or other medications that can make you drowsy. You may also develop a sudden drop in blood pressure, which can cause dizziness, nausea, and fainting. This is more likely when you are first starting the medication or when your dose is increased, or when you get up suddenly. To lower your risk, get up slowly from a sitting or lying position. If you are taking this medication for RLS, tell your doctor if your symptoms get worse in the early morning or if you start getting symptoms earlier in the evening or late afternoon (rebound RLS). A very serious allergic reaction to this drug is unlikely, but seek immediate medical attention if it occurs. Symptoms of a serious allergic reaction may include: rash, itching/swelling (especially of the face/tongue/throat), severe dizziness, trouble breathing. This is not a complete list of possible side effects. If you notice other effects not listed above, contact your doctor or pharmacist. In the US - Call your doctor for medical advice about side effects. You may report side effects to FDA at 1-800-FDA-1088. In Canada - Call your doctor for medical advice about side effects. You may report side effects to Health Canada at 1-866-234-2345. PRECAUTIONS: Before taking ropinirole, tell your doctor or pharmacist if you are allergic to it; or if you have any other allergies. This product may contain inactive ingredients, which can cause allergic reactions or other problems. Talk to your pharmacist for more details. Before using this medication, tell your doctor or pharmacist your medical history, especially of: heart problems (including irregular heartbeat), mental/mood disorders (e.g., confusion, hallucinations, psychoses, schizophrenia), difficulty walking, kidney problems, liver problems, low blood pressure, sleep disorder (e.g., sleep apnea, narcolepsy). This drug may make you dizzy or drowsy. Do not drive, use machinery, or do any activity that requires alertness until you are sure you can perform such activities safely. Limit alcoholic beverages. Caution should be taken when using this drug in the elderly because they may be at greater risk for certain side effects such as confusion, fainting, and hallucinations. This drug should be used only when clearly needed during pregnancy. Discuss the risks and benefits with your doctor. It is unknown if this medication passes into breast milk. Consult your doctor before breast-feeding. DRUG INTERACTIONS: Your healthcare professionals (e.g., doctor or pharmacist) may already be aware of any possible drug interactions and may be monitoring you for them. Do not start, stop or change the dosage of any medicine before checking with them first. Before using this medication, tell your doctor or pharmacist of all prescription and nonprescription/herbal products you may use, especially: antipsychotics (e.g., chlorpromazine, haloperidol, thiothixene), drugs affecting liver enzymes that remove ropinirole from your body (e.g., cimetidine, fluvoxamine, mexiletine, omeprazole), estrogens, metoclopramide, other drugs used for Parkinson's disease (e.g., l-dopa, carbidopa/levodopa combinations). Tell your doctor or pharmacist if you also take drugs that cause drowsiness such as: certain antihistamines (e.g., diphenhydramine), anti-seizure drugs (e.g., carbamazepine), medicine for sleep or anxiety (e.g., alprazolam, diazepam, zolpidem), muscle relaxants, narcotic pain relievers (e.g., codeine), psychiatric medicines (e.g., risperidone, amitriptyline, trazodone). Check the labels on non-prescription medications for heartburn/upset stomach. They may contain drugs such as cimetidine or omeprazole that can affect the level of ropinirole in your body. Ask your pharmacist about the safe use of those products. Check the labels on all your medicines (e.g., cough-and-cold products) because they may contain drowsiness-causing ingredients. Ask your pharmacist about the safe use of those products. Cigarette smoking decreases the level of this medication in your bloodstream. Tell your doctor if you smoke or if you have recently stopped smoking. This document does not contain all possible interactions. Therefore, before using this product, tell your doctor or pharmacist of all the products you use. Keep a list of all your medications with you, and share the list with your doctor and pharmacist. MISSED DOSE: If you are taking this for Parkinson's and you miss a dose, take it as soon as you remember. If it is almost time for the next dose, skip the missed dose and resume your usual dosing schedule. Do not double the dose to catch up. If you are taking this for RLS and you miss a dose, skip the missed dose and resume your usual dosing schedule. Do not double the dose to catch up. STORAGE: Store the US product in a tightly closed container at room temperature at 66-77 degrees F (20-25 degrees C) away from moisture and light. Store the Canadian product in a tightly closed container at between 59-86 degrees F (15-30 degrees C) away from moisture and light. Do not store in the bathroom. Keep all medications away from children and pets. Do not flush medications down the toilet or pour them into a drain unless instructed to do so. Properly discard this product when it is expired or no longer needed. Consult your pharmacist or local waste disposal company for more details about how to safely discard your product.